The four leading industries in terms of total annual revenue in the 2012 SEE industrial ranking remained unchanged for a fourth year in a row. Last year’s earnings at the top of the ranking were marked by rising revenue and declining profitability, with only the telecommunications sector reporting an increase in profit. With an 8.5% rise in total revenue to nearly 45 billion euro in 2012, the oil and gas industry remained on top for a fifth successive year. Its total net profit, however, declined to 1.1 billion euro in 2012 from 1.3 billion euro a year earlier. Electricity came in a distant second, with total revenue rising 17.2% year-on-year to 16.2 billion euro. Its total net profit tumbled to 134 million euro from 262 million euro. This slide looks even more impressive when compared with the profit of 487.4 million euro achieved in 2010. Wholesale/retail remained third for a third year running after registering a 3.3% increase in revenue to 11.6 billion euro and a net profit drop to 105 million euro from 130 million euro. Telecommunications alone among the top four industries was able to book an increase in profit. Total net profit achieved by the companies in the region climbed to 710.8 million euro in 2012 from 500 million euro a year earlier. Revenue however fell 5.1% to nearly 7.0 billion euro. The automobile industry ranked fifth in 2012 after leapfrogging the metals sector on the back of last year’s 13.2% revenue jump to 6.6 billion euro. However, the automotive industry managed to narrow its total net loss in 2012 to 12.2 million euro from 74.7 million euro the year before. Diversified holdings were the only other loss-makers in the ranking. Metals dropped to sixth place following a 4.31% fall in revenue to 5.0 billion euro. Net profit almost halved to 18.3 million euro from 30 million euro. Of the 15 industries included in this year’s SEE ranking, transportation registered the steepest revenue drop, which, interestingly enough, was accompanied by a net profit surge. Revenue slid 19% to 1.6 billion euro, while net profit soared to 162 million euro from 47.6 million euro. Registering a similar drop, agriculture saw revenue slump 18.7% to 934.4 million. Total revenue in construction was down 12.2% to 517.8 million euro. 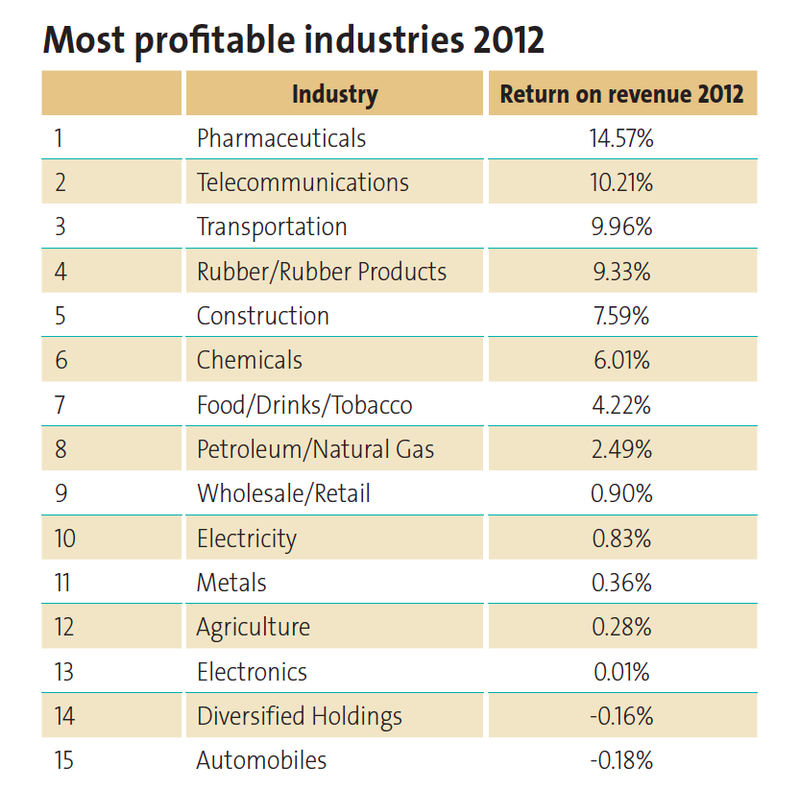 The biggest increase in total revenue was recorded by chemicals, a newcomer in the chart at the 15th place. 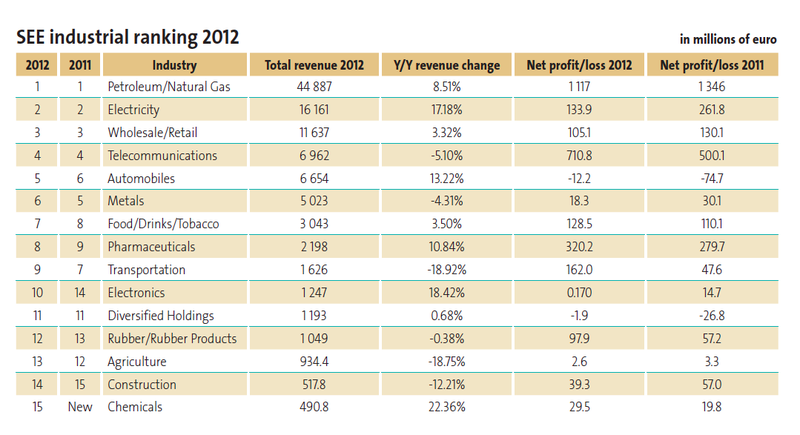 Its revenue jumped 22.3% to 491 million euro in 2012, while net profit climbed 29.5 million euro from 19.8 million euro. The ICT equipment industry, which occupied the tenth position in the previous edition of the ranking, dropped out of it in 2012. The pharmaceuticals industry was the most profitable one in 2012 with a return on sales of 14.5%, followed by telecommunications with 10.2%.